Read the Rome News-Tribune article about eighth-grader Logan Floyd's recent home run cycle during a game against Rome Middle School. Sixteen members of Darlington’s faculty and staff attended this week’s annual conference of the Southern Association for College Admission Counseling (SACAC) in Atlanta for continuing professional development in the field of college admissions. The inaugural cohort of rising seniors has been selected for next year’s Senior Ventures leadership program. Darlington’s freshman class will partner with Rome-Floyd Parks & Recreation to host the Floyd County Special Olympics on the school’s campus on Thursday, April 18 (note date change). The following college scholarships were reported to the College Guidance Office between March 1 and April 2. The following college acceptances were reported to the College Guidance Office between March 1 and April 2. Retired U.S. Congressman Pete Sessions will be the 16th speaker in the annual Class of 1953 Lectureship Series on Thursday, April 11, in Morris Chapel. Winners of the statewide Governor’s Honors Program have been announced and Kasey Barnett (‘20) has been named a finalist in the competition. Students in grades 6-8 will soon take the stage in the fine arts department’s production of “The Wizard of Oz” in the Zelle Black Box Theatre, April 12-13. Brian Inman and Al Shorey have been selected to lead the history and math departments, respectively, beginning with the 2019-2020 school year. In a brief ceremony after classes wrapped up at Darlington School on Tuesday, March 26, Tate Ratledge ('20) learned that he had been selected to play in the All-American Bowl which will be held in January, 2020 in San Antonio, Texas. Read the Rome News-Tribune article about the track meet held at Chris Hunter Stadium on Thursday, March 22. The Darlington School Chapter of the National Honor Society inducted 41 new members at a ceremony in Morris Chapel on Thursday, March 21. Read the March 16 Rome News-Tribune article about the Tigers' recent victory at the annual Rome Braves High School Invitational. 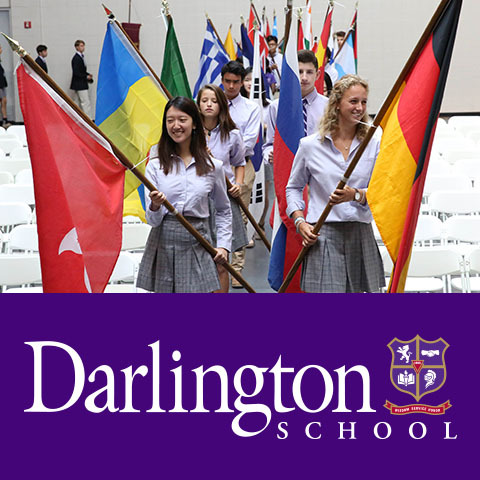 Darlington School has earned the first College Board AP® Computer Science Female Diversity Award for achieving high female representation in AP Computer Science A.